The Edwardian Era in the United Kingdom covers the reign of King Edward VII, 1901 to 1910. Sometimes that era is extended beyond King Edward's death to include the years leading up to World War I in 1914. The Edwardian Era stands out as a time of peace and plenty for Britain with widespread prosperity and no severe depressions. King Edward was the leader of a fashionable elite whose style was influenced by the art and fashions of Continental Europe. 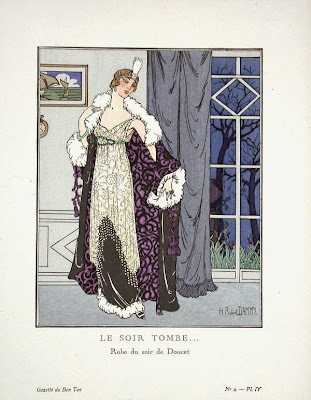 The fashion is characterized by a rich and exotic opulence in the first half of the decade 1910 to 1919 in contrast with the somber practicality of garments worn during the Great War. 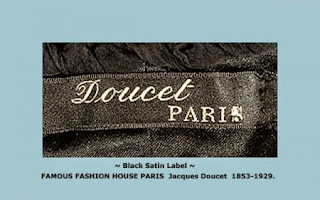 One of the most influential designers of the time was a French designer, Jacque Doucet. Pastel colors and elaborate gossamery dresses with fluid lines and flimsy diaphanous materials were a trademark of the House of Doucet. 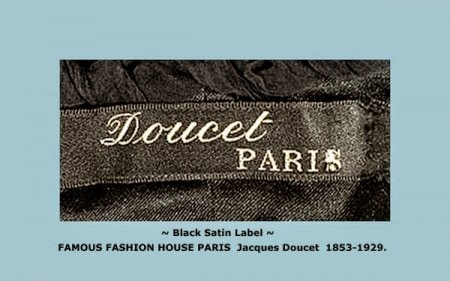 It was this period of peace and the influence of Doucet's design that inspired my gown for an upcoming special occasion. As I gathered my supplies from my stash I realized this gown could have qualified for the Historical Sew Monthly Challenge #3 - Stashbusting. This is a pattern I've wanted to sew for a while and it fit nicely with my plan for a 1912 evening/dinner gown. At Costume College 2014 I took the tour of the fabric district and a beautiful piece of silk called my name. Honest! I bought 4 yards (my budget limit) and just knew that someday this would be the base of a beautiful gown. That someday had come! Also in my stash was a beautiful piece of unknown content but it was exactly the right color for the underskirt. It has tiny silver threads and shimmers when the light hits it even underneath the silk overdress. $3.56! For the Stashbusting Challenge I had used a crinkled cotton and still have yards left to use, so that will be the base for this gown. I have a stash of beaded appliques and beaded trim and even if I have to use a combination of trims, I'm certain I have enough for the gown. Time to get started. The pattern view is deceptively simple, but the actual construction is not. A boned corset bodice is first made with hook and eye closures. The basic skirt is a simple construction, however. Corset bodice with straps and planned trim. Skirt with simple overlap opening which will be closed with snaps. The skirt will eventually attach to the corset bodice above the waistline. The underskirt with small train. The overbodice with sleeves attached. The back of the overbodice overlaps for closure. The silk overskirt pieces cut and ready to be attached. The silk overbodice is attached to a waistband. Then the skirt, overskirt and sheer overskirt are attached to the waistband. The entire piece is then attached above the waistline to the corset bodice. I sew bias tape or strips of hem lace to the edges of the sleeves and overskirt for a solid foundation for the beaded trim. Using a beaded belt I had in my stash, I add a beaded applique and lace tails. I hand sew the beaded trim to the edges of the overskirt and bodice sleeves and add a beaded applique to the lower center of the skirt. 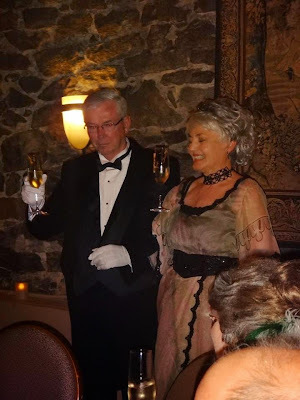 The 1912 evening/dinner gown is finished! 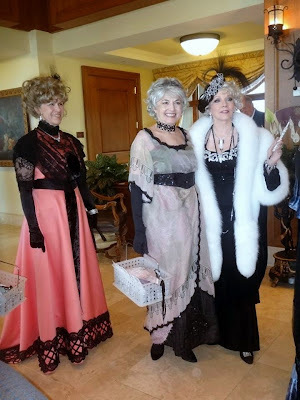 Most of the time when I finish sewing for a Historical Sew Monthly challenge I have to wait to include a photo of the gown being worn for an event. But not this time! The gown is finished on April 19th and on April 24th I leave for Biltmore Estate in Asheville, North Carolina. I've organized a costumer's dream weekend with 6 costume events and I will be wearing this gown for the Saturday evening Downton Dinner in the Champagne Cellar at The Winery. I'm excited! 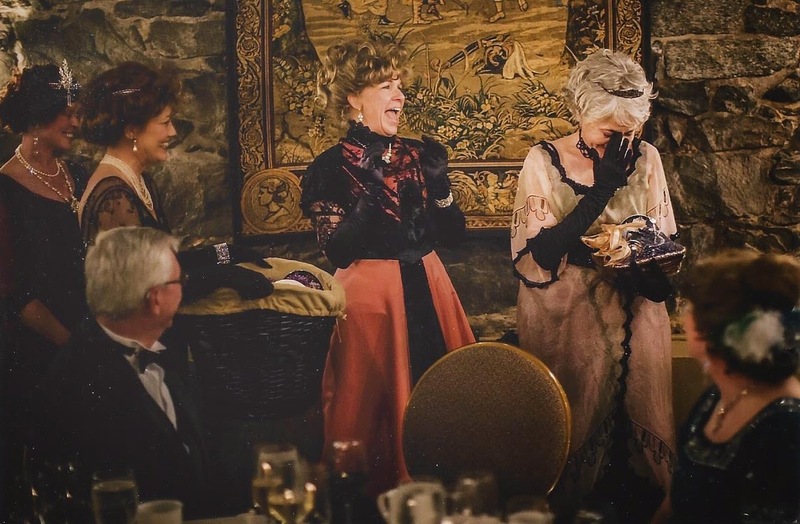 But my excitement is a bit clouded by a bee sting in the Biltmore Gardens in the afternoon which leaves me feeling a bit off in the evening and the gown reveals the red streaks across my back as my body reacts to the sting. But I manage to finish the banquet favors to be placed at the 30 seats for the dinner and make my way to the lobby for our shuttle to take us to The Winery. Randi, me, and Lonna ready for a fabulous dinner! Not a very vintage basket, is it? I've treated the guests to a champagne toast and Patrick and I toast George Vanderbilt and his dream of bringing friends and family together in beautiful surroundings, and all the dreamers in the room! And then the most amazing thing happens! Everyone has gotten together in secret and treated me to a tea setting of Vanderbilt service for four! I am so happy that the happiness brings on the tears! It is a wonderful gift and I will always treasure the gift and this moment! So I'm tearful with happiness again as I write this and there is a beautiful peace in finishing this gown and the beautiful weekend we all had together at Biltmore Estate. But those details are for another post! Oh what fun! I have seen you in your dress, but to see all the layers that went into it makes the dress so much more impressive! Wonderfully made Jeanette! Thank you so much, Gina! It was fun to make but difficult to wear since I wasn't feeling well, my tiara was too tight, and hubby didn't like the gown! But in the end, all was good! The things we do for our costume passion, right? Beautiful combination of fabrics. I love the silk you bought. It's not often you can find some with a design on it. Thank you, Val! I loved the silk too! I'm hoping to go back to the same little shop during Costume College this year. It was like sewing a cobweb it was so light but yet so amazingly strong! Oh heavens! Crystal, I'm so honored! Thank you very very much!